MC 17 - Delivering efficiency! Give busy consumers what they want most: faster, more personalised service. This advanced device acts as a consumer shopping terminal that lets your shoppers speed up the checkout process, locate items, check pricing, find complementary products and take advantage of personalised promotions and recommendations. This new level of self-service and shopping convenience results in higher sales and happier customers. The device doubles as a productivity tool for store associates, supporting a wide variety of applications — from stock and price checks, to mark downs, line busting and more. 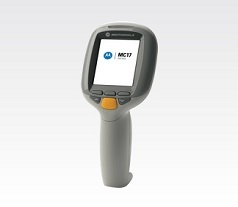 Based on open standards, the MC17 delivers reduced development costs and easy integration with POS. Standard tool set for rapid application development. Familiar platform for web-enabled applications. Dramatically simplifies development of complex web-based solutions that integrate advanced functionalities such as bar code scanning, wireless connectivity and mobile printing. Enables rich content delivery for an enhanced customer experience. Built to endure everyday drops to ensure reliable operation and investment protection. Easy to use for first time users of any age. Easy to hold; minimises user fatigue. Provides wireless freedom for your customers and instant access to information for store associates. Provides up to seven hours of continuous operation. Reduces cost, complexity, and effort associated with device management. Professional branding reminds customers of your competitive identity and provides an additional revenue stream for promotional opportunities for manufacturers.